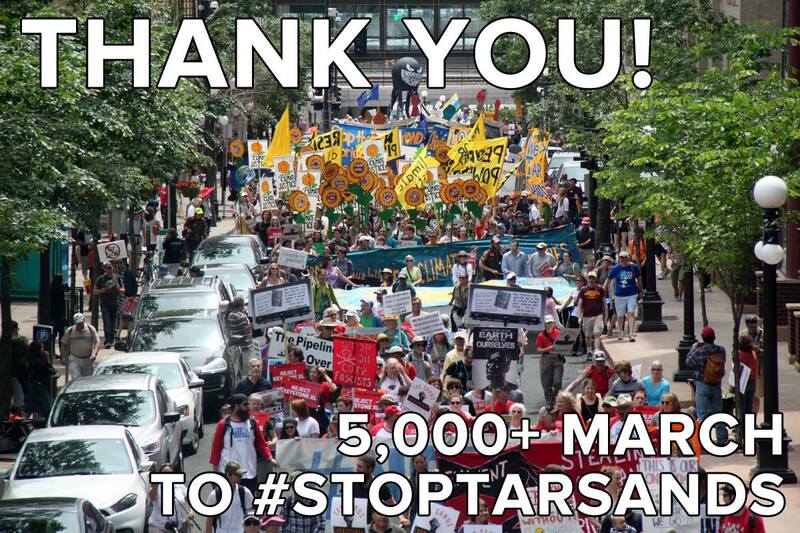 Saturday, June 6th, 2015, more than 5,000 people took to the streets of St. Paul, Minnesota to march against tar sands pipeline expansions and for clean energy solutions. From the proposed Keystone XL pipeline through the largest freshwater aquifer in Nebraska to the expansion of the Alberta Clipper and Line 3 pipelines threatening our country’s largest body of freshwater, the Great Lakes, this fight keeps water, climate and communities at the forefront. 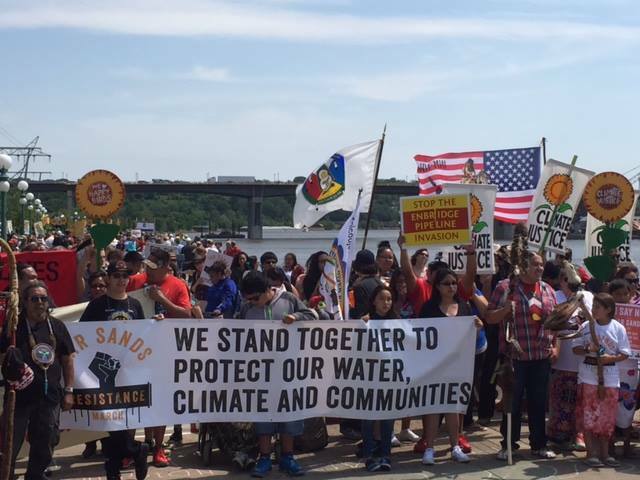 The Tar Sands Resistance March started along the banks of the Mississippi and we made our way through the streets of St. Paul to the Minnesota State Capitol. The energy of a crowd this strong was tangible throughout the throngs of people in the streets. 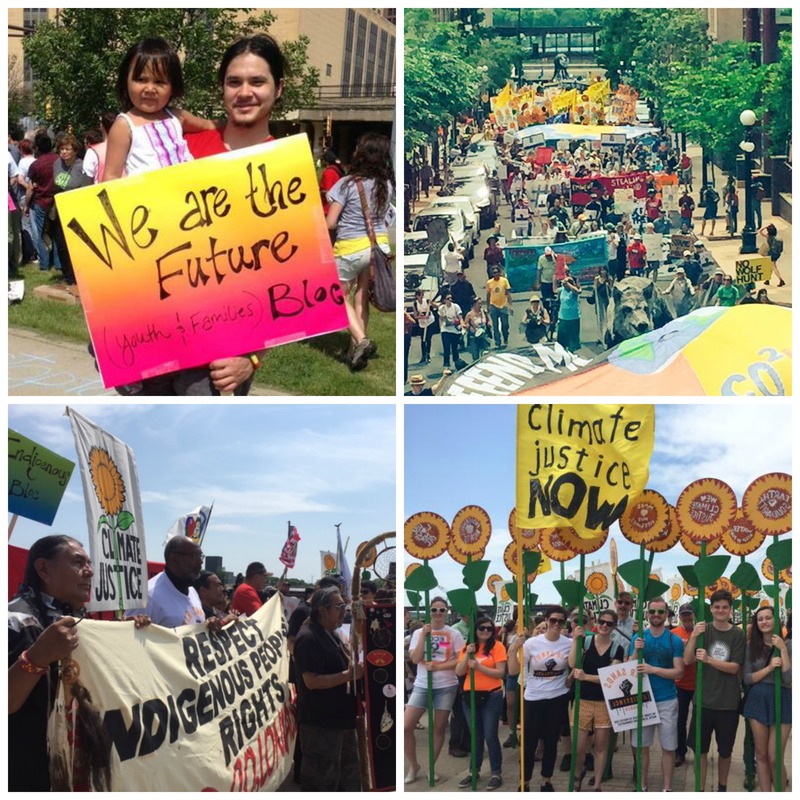 From the drums of the Hoka Hey tribal drummers and Danza Azteca at the front of the march to chants of “we are unstoppable, another world is possible” from students and grandparents alike, we made sure the power of the people standing together was heard. The March, like much of the movement against tar sands, was led by indigenous people from the Great Lakes region and from Alberta, Canada, both are places where tar sands extraction and transport threatens the health and safety of communities. From the contamination of sacred lands and waters and lack of consultation with tribal governing bodies to the long-term effects of climate change, the development and transportation of the tar sands violates indigenous treaty rights. Impacted community members from the frontlines of this fight stood together with communities of faith, students, environmental activists, landowners and many others to call for a halt to the expansion of tar sands infrastructure. Various projects have been proposed that would expand tar sands pipelines across the Great Lakes region. Enbridge, a Canadian pipeline company, seeks to nearly double the amount of tar sands crude oil it brings across the border on its Alberta Clipper pipeline, from 450,000 to 800,000 bpd, nearly the same as TransCanada’s dangerous Keystone XL pipeline. Expanding Alberta Clipper’s capacity would expose our communities and tribes to tar sands’ full complement of disturbing climate, safety, and environmental implications; potentially devastate cultural and historical resources; give the landlocked tar sands industry access to ports and enormous new overseas markets; and enable the massive, environmentally devastating tar sands growth planned by the industry. And to make matters worse, they are looking to do all of this with no public notice and bypassing the Presidential permit process. Join us to call on the Obama Administration to stop this illegal scheme: Take Action here! We have all the evidence that we need to say no to dirty tar sands. In a study in the journal Nature earlier this year, researchers found that we need to leave all the Canadian tar sands in the ground in order to avoid catastrophic climate change, and just yesterday, 100 scientists from across North America released this letter outlining the risks of toxic tar sands to our climate and public health. From the stories of people living in the shadow of tar sands refineries to devastating impacts of tar sands pipeline spills in communities near the Kalamazoo River in Michigan, it is not just the scientists who know that the tar sands need to remain in the ground to protect our water, climate and communities. As Winona LaDuke, Executive Director of Honor the Earth, said in speaking to the crowd gathered at the Capitol, our elected officials have “a choice between water and oil. It’s time to make the right choice.” And for the sake of our children and grandchildren, I sincerely hope that they do. Catherine Collentine is a tar sands campaign representative for the Sierra Club.